Ok, I’m going to jump right in. 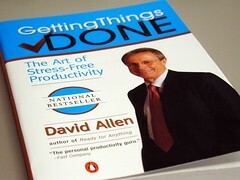 Getting Things Done (or GTD) is a system to free your mind of it’s resources and become more organized in the process. In short: it’s a way to become more productive and stress free, in one fell swoop. It’s a beautiful thing, really. The book deals mainly with the processes to the GTD system which include clearing your mind (and living space) of useless clutter, organizing it, and storing it in appropriate places, and reviewing it on a consistent basis. On the surface, it’s nothing too revolutionary. Today’s post will be focusing on the business of setting up an appropriate system to collect all of your data, both physical and psychological. Well, if it’s doable or actionable (meaning it takes 2 or less minutes to complete), go ahead and do it. Simple enough, right? If it’s doable, but takes multiple actions, we call that a project. Dump that project into a “projects” list, as a reminder that it might take a little more time to finish. You’re going to review this project list on a regular basis, so don’t worry about forgetting it. We’ve also got some other options for doable items. We can either delegate it (my personal favorite), or defer it (the procrastinator’s favorite). If you’re going to defer it (you lazy bum), then it should be broken down into next actions (more on that soon), or put on a calendar. Don’t fret! If the “thing” isn’t doable (or doesn’t need any action to complete it), you can either trash it, put it in a tickler file, or place it in a reference file. Ok, ok… get your snickering out now before you go any further. Trust me, it’s not what you think. 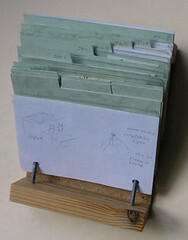 The tickler file is a file system made up of 43 folders, one for each month (12) and one for each day in the month (31). The tickler file has anything that needs reminding at regular intervals (ie. the cable bill needs to be paid on the 13th). The tickler file should be reviewed often. These are collections of general or topic-based catch-alls that hold materials that can easily be retrieved. But don’t get carried away storing everything like a pack-rat, it only muddies the system. Keep what you need, nothing more. Any item that takes longer than the magic number of 2 minutes should go on a “next action” list, and reviewed daily. It’s like a glorified to-do list, except these lists are divided into different physical contexts (ie “while I’m at the office” or “while I’m at the store”, etc.) We’ll have more on this to come. Ok, we’ve made it through the first part. That wasn’t so bad, right?